While strolling through my garden this evening, I encountered a colorful (very unwelcome) visitor on my strawberry plants. 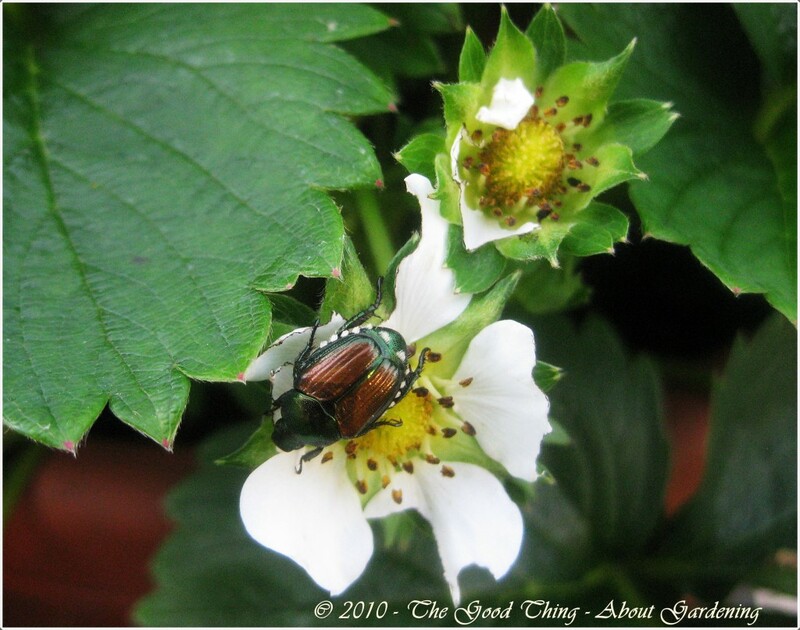 Japanese Beetles love strawberries and eggplants (and most other vegetation) and will quickly destroy a plant in no time. They are one of the most destructive garden pests. Its best to deal with them as soon as they appear, since they attract each other with pheromones. Since I only saw one, it was easy to deal with but from what I’ve read on some of the gardening sites, they can be very difficult to get rid of. Flicking them into a dish of soapy water which will kill them. Using traps to attract them (this is favored by some gardeners, but not recommended by others since it seemed to make the problem worse by attracting even more). Applying Milky Spore (click here for product info) to your lawn and garden areas (one treatment can last for up to 15 years). Picking them off and killing them. Harvesting ripe fruit promptly helps too, since they are especially attracted to overripe fruit. I’ll be keeping an eye out for these pests and removing them as soon as they appear so they don’t take over my garden. Wonderful blog! I truly love how it is uncomplicated on my eyes as well as the data is well written. I am wondering how I can be notified whenever a new post has been made. I have subscribed to your rss feed which need to do the trick! Have a nice day! Next Next post: BP Oil Geyser Capped; What About the Plastic Leak?